Caterpillar has boosted the payload of its 990K wheel loader with the introduction of its Aggregate Handler. 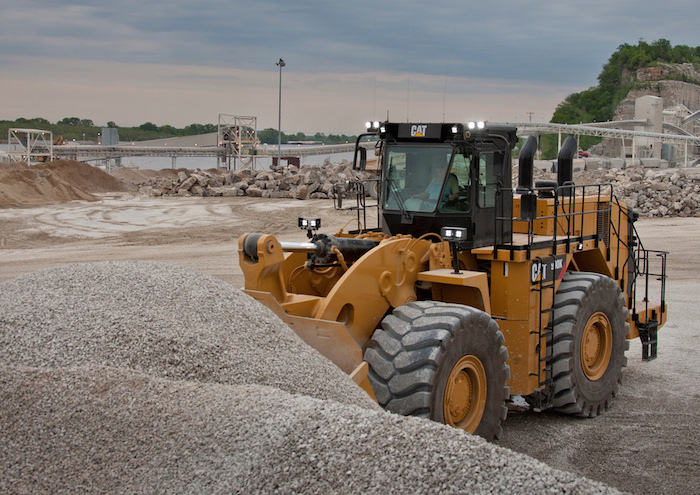 The attachment provides as much as a 25% payload increase compared with the standard 990K Wheel Loader, enabling customers to load trucks and railcars faster and to move more material in load-and-carry and stockpile handling tasks. The Cat® 990K Aggregate Handler has a payload of 22 tons (20 t) and a full-turn static tipping load of 96,426 lb (43,738 kg). Additional counterweight maintains machine stability, and the robust 990K structures ensure durability in the Aggregate Handler configuration. “The loader makes best use of general purpose and coal buckets for increased volume,” Cat says. It is available in standard lift configuration with 13.5 ft (4,108 mm) dump clearance and in high lift configuration with 15 ft (4,569 mm) dump clearance. Increased capacity and high dump clearance enable customers to load railcars and large trucks with a better pass match for faster material handling at lower cost per ton, Cat says. The 990K Aggregate Handler complements the smaller 986K and 988K Aggregate Handlers in the Cat large wheel loader line. The Aggregate Handler, however, is not designed for use in quarry face or other shot rock applications, according to Cat. The new 990K Aggregate Handler is built on the proven features of the 990K wheel loader, Cat says. “The 990K powertrain provides powerful operation with superior fuel efficiency. The Cat C27 engine powers the loader and delivers net power of 699 hp (521 kW). Lower engine speed helps drive economical fuel use. Additional fuel savings accrue with the ECO Mode (on-demand throttle), engine-idle shutdown system, and engine-idle kickdown/auto-resume system,” the company says. Cat’s exclusive, field-proven impeller clutch torque converter uses a lock-up clutch, providing direct drive to boost fuel economy, cut cycle times and reduce heat. This is especially so in load-and-carry applications, Cat says. “The system allows operators to balance rimpull and hydraulic power for optimum loading efficiency. Positive Flow Control implement hydraulics use a variable displacement, electronically controlled pump to precisely apportion oil flow based on operator control inputs,” the company says. The operator station features the Cat Vital Information Management System, VIMS™ 3G, which provides customisable operator profiles, a cycle timer and an integral Payload Control System for “on-the-go payload weighing”, Cat says. The company says the graphical information display is easy to use and keeps key information in front of the operator, while the Cat Comfort III seat provides integrated seat-mounted controls making for smooth and comfortable operation. Transmission controls, integral with the STIC™ steering lever, allow convenient travel control, Cat says. The 990K is equipped with the Cat Vision rearview camera system and in-cab display for improved visibility. The Cat Detect object detection system, available as an option, builds on this system with radars and in-cab software that provide notification to the operator when an object is detected within the radar coverage area.